Additional material is available for the Battle of Midway. United States forces to counter such an attack were relatively weak, but the Japanese intentions were suspected by the United States Command. [Note: this account was written long before the wildly successful efforts of American cryptanalysts in decrypting the Japanese naval codes was declassified. The reader is encouraged to see the index page which includes accounts of these operations and their decisive effect on the Battle of Midway.] Naval losses sustained at Pearl Harbor and in the Battle of the Coral Sea had not been replaced. 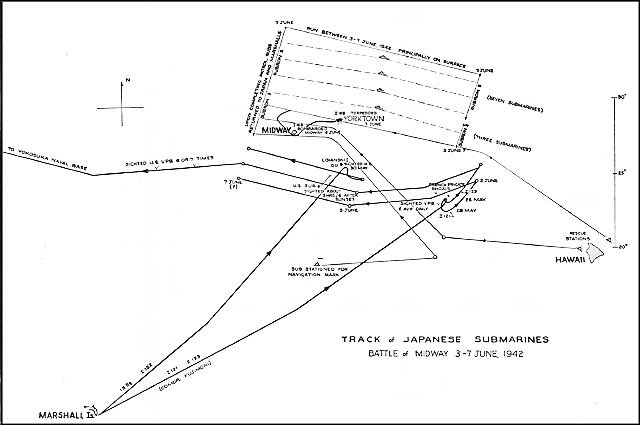 In view of this deficiency it was decided not to commit the United States surface vessels, but instead to reduce the strength of the Japanese Fleet through attrition, prior to its arrival at the objective, by means of long-range air attack from the three carriers then steaming at top speed from the Coral Sea toward Midway. 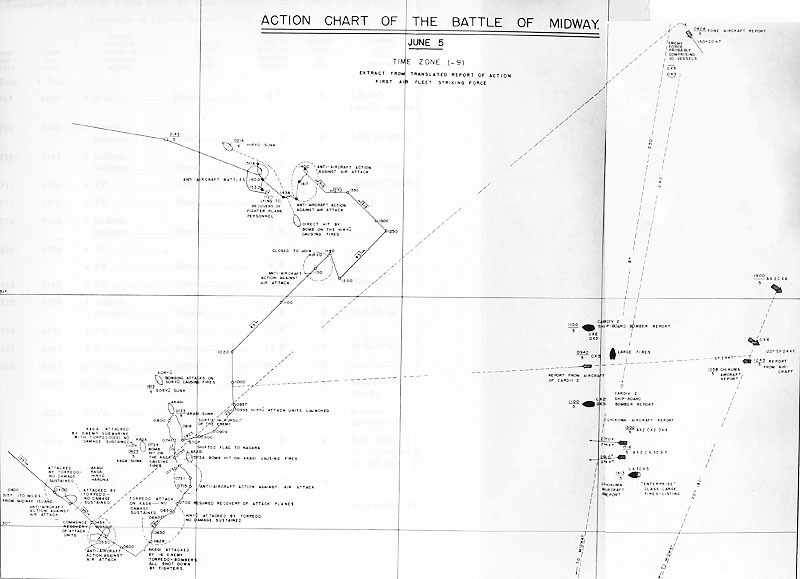 In addition, the local defenses of Midway were strengthened, a submarine cordon was established, and Marine aircraft squadrons and long-range Army and Navy search planes were concentrated at Midway. In the meantime, a second aircraft striking group was launched by the enemy including all aircraft from the as yet undamaged Hiryu. This group attacked the United States Task Force, scoring three bomb hits on Yorktown which put her flight deck out of action, and forced her withdrawal from the battle. Three days later, while retiring to the eastward, Yorktown and the destroyer Hammen were sunk by torpedoes from the Japanese submarine I-168. 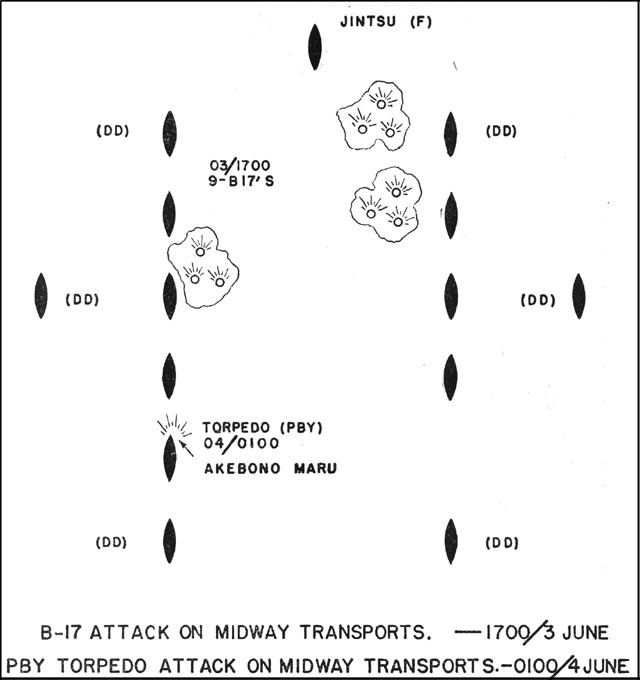 On the 5th adverse weather conditions prevented United States carrier groups from locating the retreating forces to the north and west of Midway, although a Marine dive bombing group from Midway located the crippled Mogami to the southwest and inflicted additional minor damage to this vessel and Mikuma .